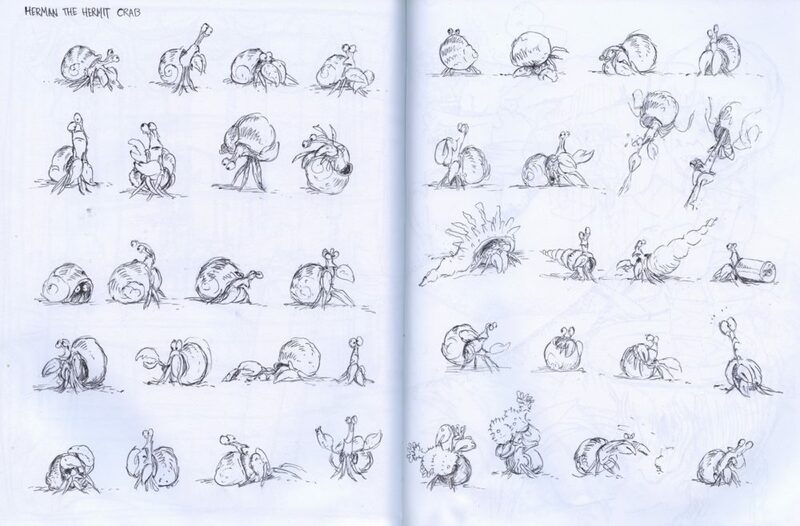 Herman is a hermit crab character based on a series of doodles I made in my sketchbook while in Hong Kong last month. I had been away from the 3D work for a few months when this began but was happy to discover that I had not forgotten very much. The work passed quickly and without any major setbacks. All in all Herman took only one day to sculpt and another day to pose. Posing was a bit more complicated than I expected. All of the legs were a problem to matte and transpose in zbrush and for some reason I was having a bit of difficulty with the Zsphere rigging technique as well. He is a character that merits having his legs in a tangle all the time but that makes for slow selection work in Zbrush. Originally I had set up polygroups to simplify the selection process but for reasons I don’t understand Zbrush deleted these and I had to do everything by hand. If I have time I would like to have a stab at rigging Herman properly in maya. I think he would animate well. For the record, below is the sketchbook doodles and first-pass rough model.